3. As soon as I hit live view I recieved the error. Ive been seeing it in all modes for live view. * I heard there's an HMDI solution but I currently don't have my hdmi cable. If anyone knows if that method is a sure fix please let me know so I can try to get my hands on one. Please let me know if I can be helped or if I doomed. Also Im new to this so I'm not sure what other information devs need. ERR70 covers well over 1000 different conditions; cannot jump to conclusions just like that. That means, you are able to navigate Canon menus and launch the Firmware Update process, right? As soon as I hit live view I recieved the error. Ive been seeing it in all modes for live view. 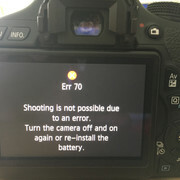 Is this the only situation that triggers ERR70? Can you take pictures, for example? Yes I am currently able to navigate all the canon menus including the launch Firmware Update process. I am also in the process of trying to get a diagnostic log as you said.